The purpose of this thread is to provide a place to discuss all things Rolo related. Last edited by Klashikari; 2008-04-22 at 08:54. I dont understand what really rollo is. DOes he know hes not his brother. and y is he so protective of the locket? I believe that we should categorize it as a mind stop ability. His power does not stop time within this radius, which can be shown by the water that continues to flow in the scene in episode 3. If I was to compare it to any weapon, I'd call it an EMP for the mind. I am guessing that Rollo is probably an orphan (just like Mao) or a clone who nobody cares. I believe he really yearns family. That's why he really protect that locket since it is probably the first time someone gave him a birthday present. That will ikely become the reason why he will help Lelouch in the end considering that Lulu (in the past one tear) is probably the first person who "cares" for him. Yup, an "EMP for the mind" would probably be a rather accurate description. The scene where he disappears in front of Kallen and Urabe doesn't seem to add up though. I almost think that they made a mistake in that scene. Time is obviously not frozen when Rolo does his thing. We, the viewers, were also "affected" by his Geass in Turn 2 when it looked as if he teleported himself and his Vincent in order to get past his attackers and end up standing in front of Lelouch. Both Kallen and Urabe should have "teleported" as well since they were moving at high speed when it happened. Well they wouldn't have to be teleported or anything at all, since they're inside their Knightmares. Those things would still be moving, even if their pilots are mentally not there for a few seconds. Yeah, that was my point. Their KMFs would've kept moving during the time we were Geassed and it would've seemed as if they also teleported. So Rollo's severely messed up in the head and has abandonment issues and an inferiority complex towards Nunnally and doesn't care at all about human life in general. 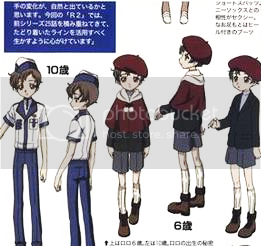 And the workings of his geass are confusing because of protrayals in episodes 27 and 28.
wasn't Rollo a cute child? but it looks like.he had to act with royal people...although..
Hypothetically, if the Geass is restricted to abilities only able to manipulate the mind, then it's likely the knightmares weren't stopped at all. Because if Rollo did deflect both of Urabe's and Kallen's attack, which I doubt he did and simply charged forward, then I suspect their mobile suits wouldn't have continued with their current momentum. Since their momentum didn't stop, I would think Rollo simply charged forward given the gap made by Urabe and Kallen. But the real question is what's the limit to Rollo's Geass? So far we know it has an "EMP" effect range, which to me looks like the size of a regular track and field course. The sentimental value Rollo has with the locket is something I can't really put a finger on. I'll probably post my thoughts of it when I think of more later. Location: And you want to know...why? his piloting skills are superior to suzakus. first v.v. next rollo. then what? superman? Good Black Ops antagonist/undercover agent with a very potent super-power. That's really all I can say about Rollo so far, after watching 3 episodes of Season 3. I believe he really yearns family. That's why he really protect that locket since it is probably the first time someone gave him a birthday present. That will ikely become the reason why he will help Lelouch in the end considering that Lulu (in the past one tear) is probably the first person who "cares" for him. I like that part of him. Oh, i posted in Episode 3 thread, should have figured a Rollo's Geass speculation thread would be best in this one. Neways original post is what follows - spoiler to make it easier to navigate. So given so far all geass has been mind stuff, Rollo's being "mind stop" would be most plausible. CNS- Central nervous system, lets just put the brain there to make it simple, this is where information is sent to from Sensory receptors, and is the place where information is processed, stored, and many other functions. This is where you send information out as well, give commands to motor cells for example, to move. Motor neurons - these motor cells recieve infromation to do motor type of actions, move a leg, arm etc. Example you see a bear, then run. First information through visual light are sent from the bear to your eyes(visual receptors), visual receptors send information along neruons to CNS. CNS recieves information and process (this is when you actually "see" the bear), gives emergency command to run, sends information out. Command information is sent out to leg motor cells, activating and causing them to move and run away. That being all said. Rollo's "mind stop" is most likely a FREEZE (stop) of INFORMATION at the CNS (brain/ mind) meaning, if rollo geassed you when you looked at the bear, information sent from visual receptors, go to CNS, but then it waits outside, CNS is frozen doesnt let anythign in or out as a result body is currently frozen, theres no thought or anything, geass wears off, information follows through as normal. How about we apply this to the 2 episodes. Geass wears off (VERY SOON AFTER) it doesnt have to be long, this is when you hear Urabe say "Too slow!" and see Gekka swing the sword down at an image/afterimage of the vincent as well as hault. So does the "mind stop" theory work? consider , Kallen and Urabe and Lelouch and OUR EYES(audience eyes, ill clarify) are affected by Rollo's geass at point i stated earlier. Vincent moves out of the way, towards Lelouch (geass freeze is still on), only thing moving are mechs accelerating towards Vincent's old spot. Ok the visual information on Vincent standing is waiting outside the CNS right? Give few seconds (their time) Geass is OFF, old information is reaching into CNS, CNS for Kallen and Urabe is now still seeing Vincent at same spot. Their CNS, brain, send commands, to cut, slow down etc, and it goes to motor receptors, and act follows. HOWEVER once the geass went off, new visual information is also being sent to visual receptors, and sent to CNS. These visual information show nothing there, so Kallen, and Urabe brain is also after a bit of time is showing BOTH the image of Vincent being there, and it not being there, thus the Blinking after image of the mech. This case, we clearly see that when Rollo uses geass, water is still moving within the radius + vilette's hair is still moving, thus making time freeze highly unlikely. There is no need to guess when he uses geass, and when it wears off either as its clearly stated. The only difference in this scene is that we the audience sees the geass in the aspect of Rollo this time, we are "not affected per se" and are able to see his movements to kill the random informant and thus is saying visual information from the seen is proceeding normally to our CNS, thus we see his clear movements, unlike if we were to be affected, then instead we would see would be a teleportation from once place to the other, like in EP 2. Thus noting, I should probably include some other points that people would bring up, such as how did he survive that explosion when Urabe did that move? if Rollo didnt freeze time. Although this argument is weak, its probably an easy thing for a Lancealot(god-mode mech) protoype be heavy armored and such, thus able to absorbed an explosion, actually besides foot soilder mechs, the main character ones always seem to be quite sturdy, thus this explanation is probably just as good as time freeze, + given the explanantion for "mind freeze" instead, probably better to place your bet on "Mind freeze + Strong lancealot prototype" than on "Time freeze, with the exception of gravity -_- argument"
As for possibly, why did the Vincent bother "teleporting" or rather "moving" to the side using geass even though he simply absorbed explosion damage. Simple speculations could simply be, how about an element of surprise -By freezing the mind + moving away)(move to lelouche's side for an attack) this would be offensive way OR how about freezing the mind to stop any further attacks at the explosion and get to the side for safety (defensive) . this explanation would be to the effect that incase Lelouche or anyone else would add extra shots into the general area he was, so for safety he would geass, freeze, and move to safety. mind EMP is definately possible but lulu said "he stopped time" which is probably how the CG staff is trying to explain it to us. Does anyone else think rollo is gay? He acts like lulu is more than someone he's just spying on... i think he has feelings for him. I don't think Lelouch's explanation is supposed to mean anything. I mean, to him it must have seem like time stopped with the gun missing and Rollo right behind him.